Airports are not enjoyable places to be. Long distance travel is not a tonne of fun. Badly designed boarding passes are annoying. Seriously annoying. The boarding pass is essential for air travel but when badly designed, must be one of the most counter-productive items an airline could issue. I think they cause headaches for airline and airport staff and travellers alike. Travellers are often stressed, emotional, groggy, jet lagged or a toxic mix of all four. The thought of having to decode a rubix-cube-puzzle of crucial information in that state makes me want to just give up. You may have read Tyler Thompson’s post— I did, and on every plane journey since, I have looked at my boarding pass with a little bit more intrigue. Wondering why it is the way it is, pondering what it couldlook like? Flexible content restrictions. I have a long surname at 13 characters, I am sure others can go longer. Getting that on a ticket with long strings of other characters is troublesome. I wanted to solve not only the aesthetics of the boarding pass, but the layout of information in order of importance and chronology— meaning from the start of your journey ‘til you arrive at your destination gate. There needs to be some chronology. You don’t need to know your seat number until you are on the plane. Before that, the questions are What time do I fly? What gate do I leave from? Which boarding group am I in. I wanted my design to answer these in the order you would ask them. Seat number: What to look for. Seat location: Front or rear of plane. Seat type: Aisle, Centre or Window. The other thing I would love to include is a halfway fold… I bet you have had this happen — You stick your boarding pass in your pocket, take it out at the gate and the stub is hanging off. You reached peak perforation too soon! I would include a foldline on the reverse of the ticket that leaves the stub nicely intact and means you can put the pass into your passport neatly. Here is a breakdown of the design based on some of my ideas. Boarding passes need to change. 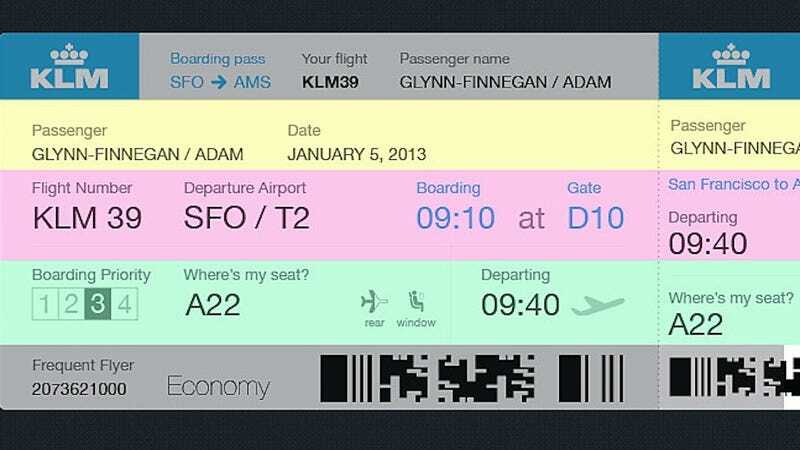 But here’s the question: Is re-structuring the information enough or is the whole boarding pass concept obsolete? This post originally appeared on Medium and was republished with permission. Adam Glynn-Finnegan, a winner of 2 Webby Awards, is a Graphic Designer for Evernote, enjoyer of mountain biking, drinker of coffee, resident at Duke Studios in Leeds, UK and frequent traveller to San Francisco. You can find him on Twitter here.